Frank Shepard Fairey (the guy who created the Obama ‘Hope’ image ) was commissioned to create a poster promoting the WWF’s 2009 Earth Hour (more info on March 28th’s big event here) and above is the fruits of his labour. I’m not sure the title of ‘Vote Earth’ and the call to action of ‘your light switch is your vote’ is as coherent as it could have been. The logic police would call you up on the fact that if ‘your light switch is your vote’ then the two options would be ‘on’ or ‘off’ (I suppose if you say ‘earth’ in a french accent it sounds like ‘off’) and not ‘earth’. I can see what John Howard means when he says that: “being paid-for advertising, [it] lacks something of the simplicity, immediacy and purity” of the Obama piece. 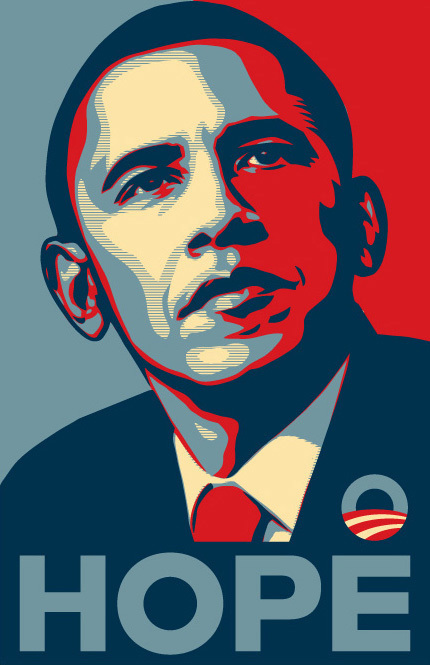 It was always a risk doing an ‘environmental version’ of the Obama piece; I think Earth Hour would have got the same PR if they had commissioned Shepard Fairey to do something completely different and it wouldn’t subsequently be judged to the same extortionately high standard as ‘hope’. What a let off!! I can save the planet and raise awareness of climate change by simply turing off all the lights for a bit…and you never know, I might even be down the pub on the evening of the 28th so the lights will be off anyway which would be handy. Raising awareness first is usually a good idea if you want people to do stuff, which this campaign clearly does. Switching off your lights is also quite a symbolic transitional act: light to darkness, yes to no, white to black etc. A powerful statement for for all those people who can’t really be bothered to do anything that will actually save the planet. However, as the power companies have warned us, millions of people turning their domestic power on and off can result in disastrous power surges which can “pop” power stations and ironically cause blackouts. After the hour long “switch off” as people pat themselves on the back before they switch all their lights on and make a celebratory cup of tea whilst boiling their 2 million watt kettle, there is a genuine possibility of a power cut. Involuntary blackouts – a taste of things to come once our national Governments have finally snorted all our fossil fuels up their fat pimpled nostrils.